Through our experiences with taco trucking, we’ve learned to be concerned for anyone that debuts in the cold seasons. Sad truth is, they don’t often last long enough to see the food truck friendly months. 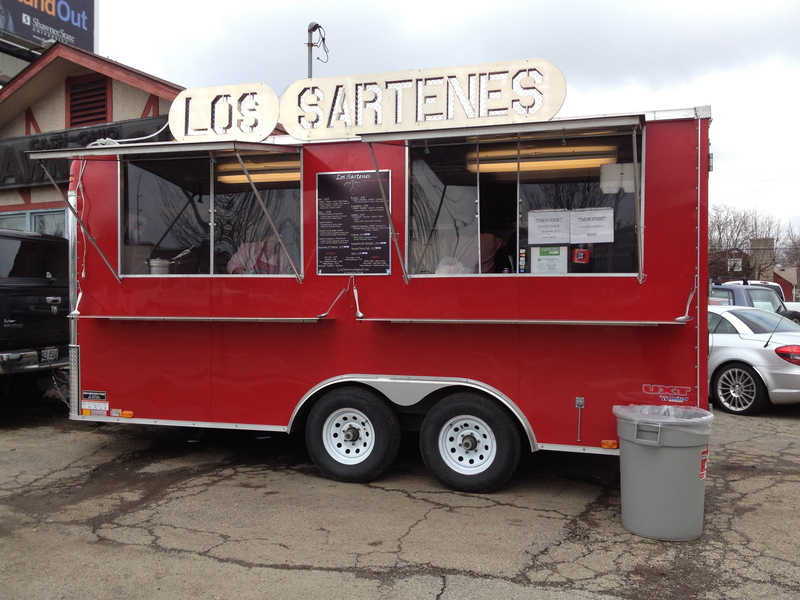 Los Sartenes opened a month or so ago – in the dead of winter – but we’d wager that they’ll experience a much kinder fate. First off, this isn’t a low-budget operation. It’s slick in the best sense of the word. From the tidiness of the kitchen to the conspicuous newness of the trailer to the impressive clarity of the menus (both posted and takeaway), it’s clear that much planning has occurred and that plans have been executed skillfully. 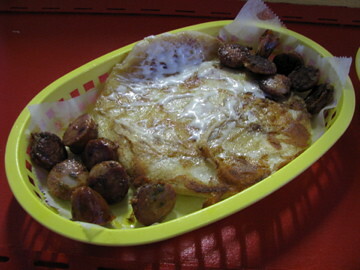 Traditionally a Salvadoran dish, the pupusa kicks off our exploration of the Central American side of the menu. 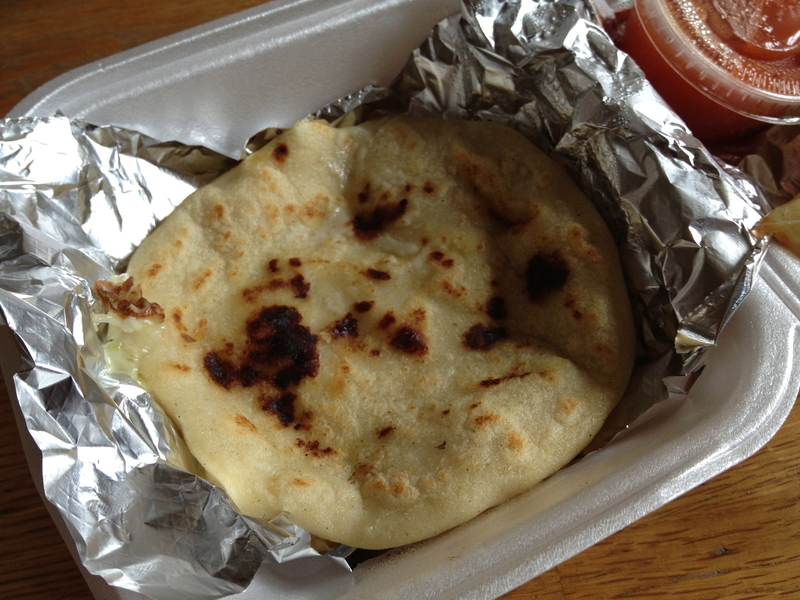 Essentially a thick corn tortilla pancake filled with any of a variety of ingredients, a good pupusa is a great thing. We tried their cheese version and it was no exception. 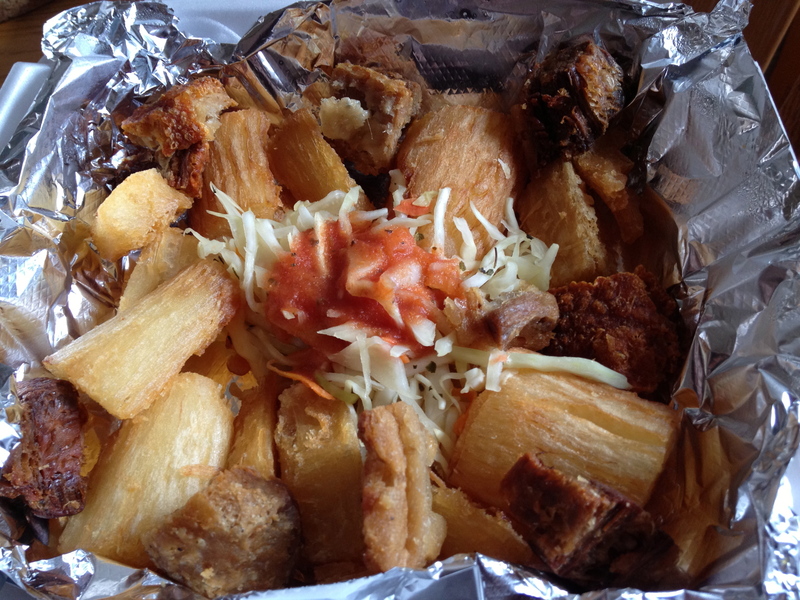 For a truck that defies expectations, their yuca dish epitomizes it. We’ve previously thought of yuca as a Brazilian root vegetable side dish, and something that’s mushy, starchy, and kind of inert. But then again, we’d never seen it served with generous chunks of fried pork belly, curtido, and sauce. They’ve upped the yuca game, folks. 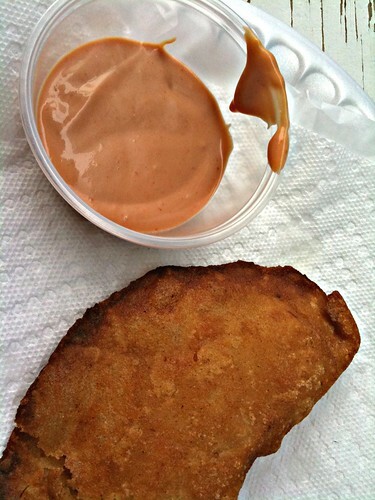 We were excited to see empanadas de platanos on the menu; they’re a favorite Salvadoran snack of ours, and hard to come by locally. 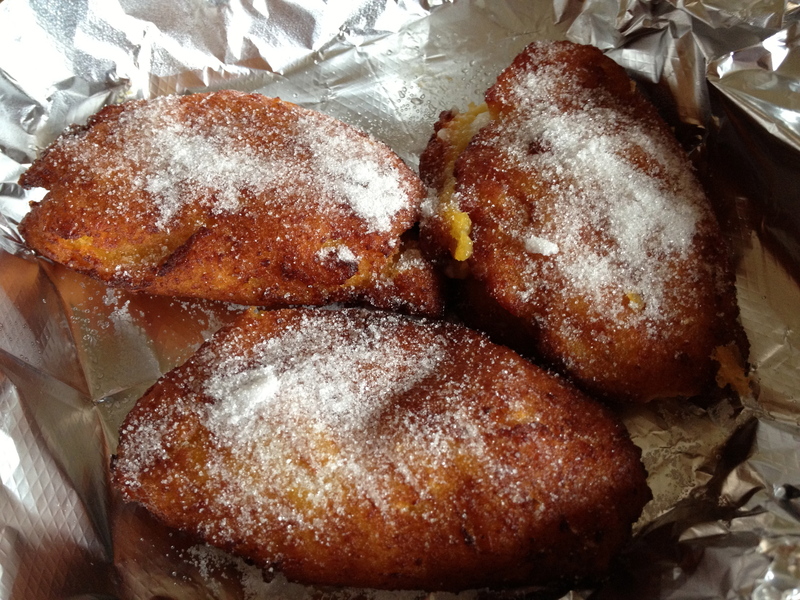 Los Sartenes’ version didn’t disappoint – the empanada shell consists of a thick layer of mashed sweet plantain filled with a sweet soft cheese, and the whole shebang is fried and dusted with sugar. Don’t let the use of ‘sweet’ and ‘sugar’ deceive, though – while these are certainly dessert-worthy, they’re nonetheless fairly tame on the sweetness spectrum. And, they’re really good. The menu is unusually extensive, and the fine folks that alerted us to their location (thanks Jeff & Pablo!) 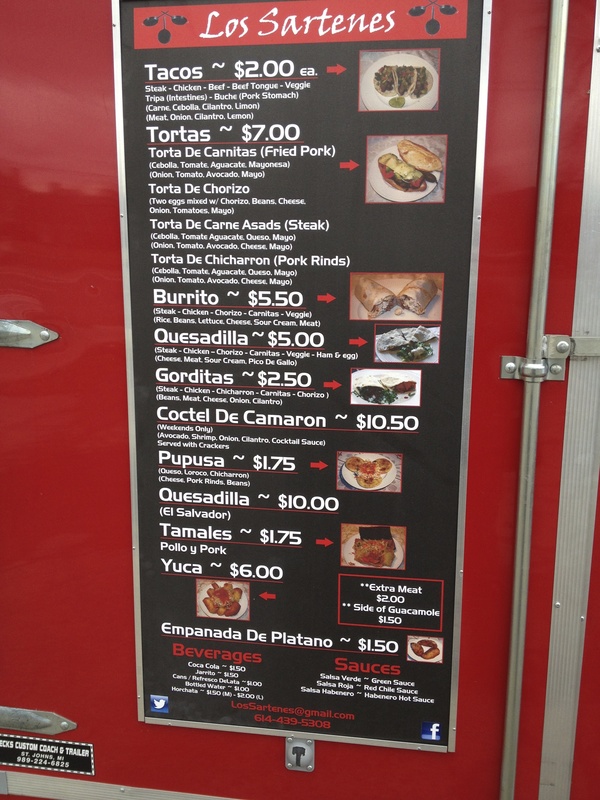 have mentioned a few other dishes that we need to try (the carnitas torta being first among them). Check these guys out, and let us know what you thought! The days are getting shorter, the kids are trudging back to school, OSU football’s in full swing – fall is in the air in central Ohio. And, we’ve just stumbled upon a new taco truck. Specializing in seafood. When we asked the folks at Las Brisas how long they’ve been opened, the response was ‘4 days’. This served to a) reinforce our desire to believe that no truck in Columbus goes unnoticed by us for long, and b) hope they’ll be able to weather the seasons to come and make it through to prime ceviche slinging weather. 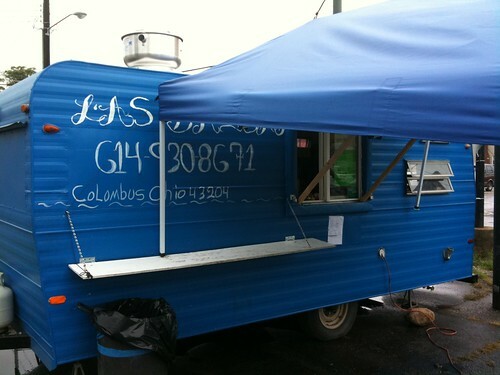 It’s nice to see a taco truck alternative to Mi Chula’s seafood offering, and from what we’ve seen Las Brisas should be able to hold their own in this niche of two. 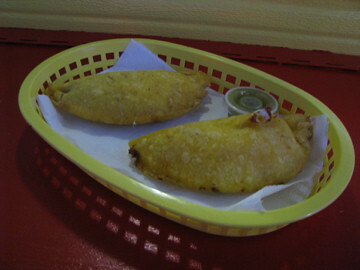 The empanadas were tasty – light, flaky, expertly fried pockets enveloping a generous portion of diced shrimp and cheese filling. Good on their own, and delicious when dipped into the creamy red sauce that accompany them. 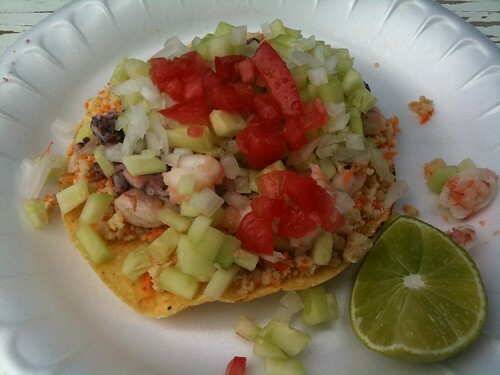 We also tried the tostadas mixtas, which is a fried tortilla topped with a mixed ceviche comprised of shrimp, fish, and octopus. Light and refreshing – perfect as a… umm… quick cool snack on a blazing summer afternoon. 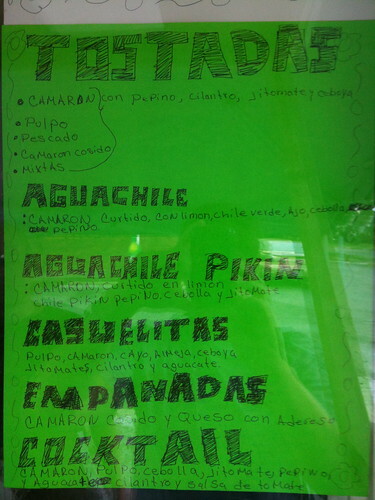 Las Brisas has a somewhat confusing mishmash of menus taped up around their service window with hot dogs, hamburgers and steak tacos in addition to their seafood specialities. We’ll be back to try out some of the other items, and we’d love to hear from you in the comments if you get the chance to explore their selection as well.